A Russian adoptive mother discusses the process of integrating a new child into her family. The last time Vlada’s drug-addicted biological mother was jailed, the eight-year old girl was sent to a rehabilitation center – a facility where children whose parents are incapable of caring for them stay before being adopted or sent to an orphanage. Fortunately for Vlada, her stay there was relatively short, as there was already a family anxious to take her home. Mikhail and Olga Sitnikov, who live in the village of Ilyinskaya in the Krasnodar Region, had long dreamed of adopting another daughter. They already had adopted one girl two years earlier, Nastya, to join their family, which also includes two biological sons, Volodya and Seryozha. 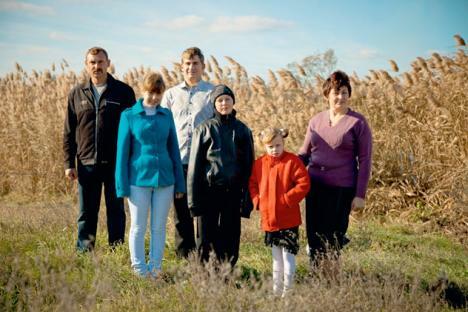 In order to bring Vlada into their family, the Sitnikovs had to ask for permission from each of their children. “Under the latest regulations, foster parents are required to prepare a whole set of documents,” said Elena Iroitina, an expert on families and children. The list of requirements includes, among other things: written consent from every family member aged over 10, no history of certain diseases or previous convictions and adequate housing conditions. Nastya was sullen during one of their first meals together. Vlada moved close to her and gave her a long look. “You were adopted too, weren’t you?” Valda asked. “Yes, I was,” said Nastya, a little angrily. Olga agrees that there are some challenges to raising adopted children, but that they are not as her colleague imagines. After Vlada recently started her second year at school it soon became apparent that she could barely read. “She has had hardly any upbringing at all,” Olga said. “It seems that no one actually did anything to educate her. It appears that adults applied the principle: ‘do as you please, just don’t bother us.’ She is still a little girl and she needs to be shown things, to be told and given things – and, in the end, Vlada is now getting more attention than Nastya. I’ve noticed Nastya is jealous.” But sibling rivalry is something all families experience. The reason that Olga is afraid Vlada might be taken away is because officially, the rights of her biological mother have not yet been terminated and are pending a December hearing. Once Vlada’s original mother’s rights are revoked however, Olga will cease to be a guardian and become her foster parent. She is looking forward to that day as well as celebrating the upcoming winter holidays as a family. She usually cooks a special kind of roast and for one of Vlada’s first days with the Sitnikov family she went ahead and prepared the dish. For her, keeping children quiet and out of the way are not what makes a family. She doesn’t have any grand ideas about what keeps her family together, besides love. First published in The Russian Reporter magazine.